Gram-negative bacilli (GNB) are bacteria frequently encountered in clinical settings, both as normal flora and as pathogens in a variety of infections. The use of antibiotics has led to the emergence of various resistance mechanisms and some of these bacteria are now resistant to several classes of antibiotics. 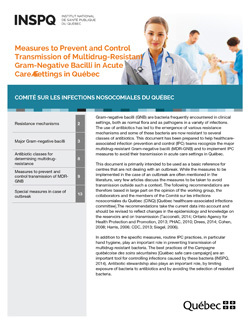 This document has been prepared to help healthcare-associated infection prevention and control (IPC) teams recognize the major multidrug-resistant Gram-negative bacilli (MDR-GNB) and to implement IPC measures to avoid their transmission in acute care settings in Québec. This document is primarily intended to be used as a basic reference for centres that are not dealing with an outbreak. While the measures to be implemented in the case of an outbreak are often mentioned in the literature, very few articles discuss the measures to be taken to avoid transmission outside such a context. The following recommendations are therefore based in large part on the opinion of the working group, the collaborators and the members of the Comité sur les infections nosocomiales du Québec (CINQ) [Québec healthcare-associated infections committee].The recommendations take the current data into account and should be revised to reflect changes in the epidemiology and knowledge on the reservoirs and on transmission (Tacconelli, 2014; Ontario Agency for Health Protection and Promotion, 2013; PHAC, 2010; Drees, 2014; Cohen, 2008; Harris, 2006; CDC, 2013; Siegel, 2006). In addition to the specific measures, routine IPC practices, in particular hand hygiene, play an important role in preventing transmission of multidrug-resistant bacteria. The best practices of the Campagne québécoise des soins sécuritaires [Québec safe care campaign] are an important tool for controlling infections caused by these bacteria (INSPQ, 2014). Antibiotic stewardship also plays an important role, by limiting exposure of bacteria to antibiotics and by avoiding the selection of resistant bacteria.